Is it the troll bridge, with a gruff troll waiting for a fat Billy goat to cross? Or maybe it’s the bridge to Terabithia. Wherever your imagination takes you, this gorgeous bridge in the Capitol State Forest at the Margaret McKenny Campground is the entrance to an enchanting ride that takes your through forests and clearings. The green canvas is splashed with colorful wildflowers and berries in pink, red, yellow, white and hues of purple. 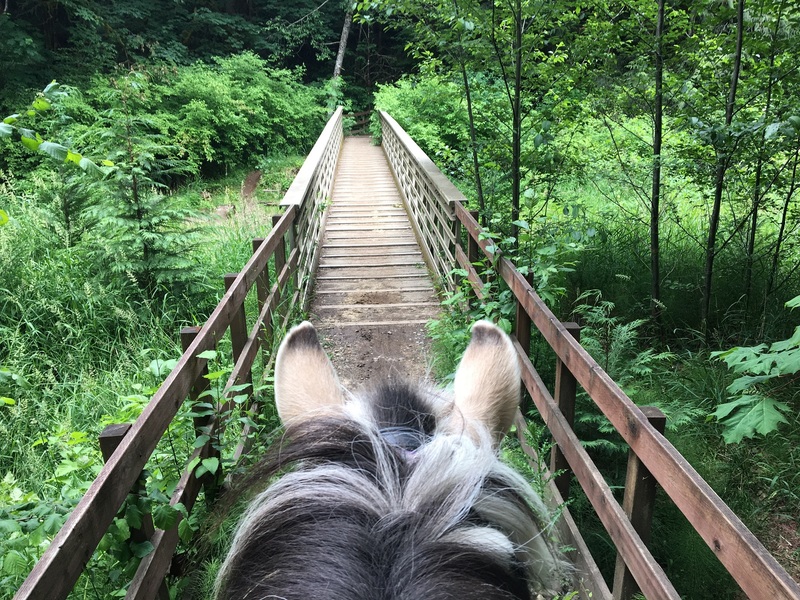 The equine loop is just four miles, but it as you saunter through the blanket of ferns and towering Douglas Firs, it feels like time stops. Go at the right time of year (June-July) and you will seeing towering fox glove blooming in full glory in a clearing along the route. It’s truly worth it just to see these flowers, which are taller than some horses! The equine loop is closed to everything but walkers and horses (no mountain bikes allowed), making it a real escape from the modern world. Looking for a longer ride? The Margaret McKenny Campground intersects with other trails, including the McKenny/Mima loop that is 13 miles. All trails have steep hills, and are considered moderate to challenging, but they are also breathtakingly beautiful. Pack a picnic and stay for the day in this stunning forest. You will be glad you did. For more information, visit the Capitol State Forest webpage.